A revolutionary new technique that has brightened the smile of many of our adult patients! The Invisalign system is the best way to transform your smile without interfering with your day-to-day life. Invisalign is the invisible way to straighten teeth using a series of custom-made nearly undetectable aligners. After an initial examination, a diagnostic "work up" is performed involving somewhat complex record taking. Following a feasibility study, you and your dentist decide together what's best for you. It's exciting to view on screen, by virtual reality, the before, during, and after/completed results. 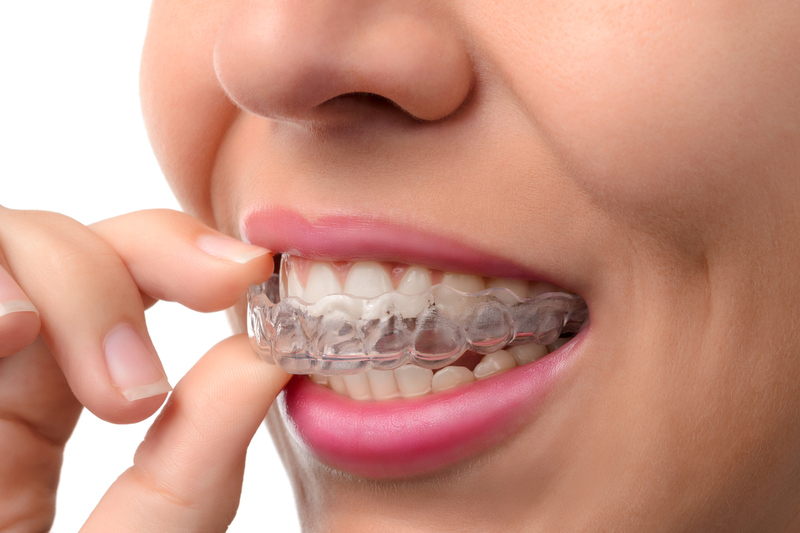 Each one of your comfortable aligners is precisely calibrated and constructed to fit snugly over your teeth while gently moving them through every stage of your treatment plan. No irritating wires or brackets rubbing against your cheeks or tongue! With Invisalign you'll smile more during treatment, and you'll spend less time in our office having adjustments! The Invisalign aligners are removable, so you can still enjoy your favorite foods and smile without holding back. Also no interference with flossing, your favorite extracurricular activity! Advanced Dental Care offers Invisalign at our Providence, Rhode Island ( RI ) office. Request a consultation today by either filling out our request form, or by calling our office at (401) 273-6780.